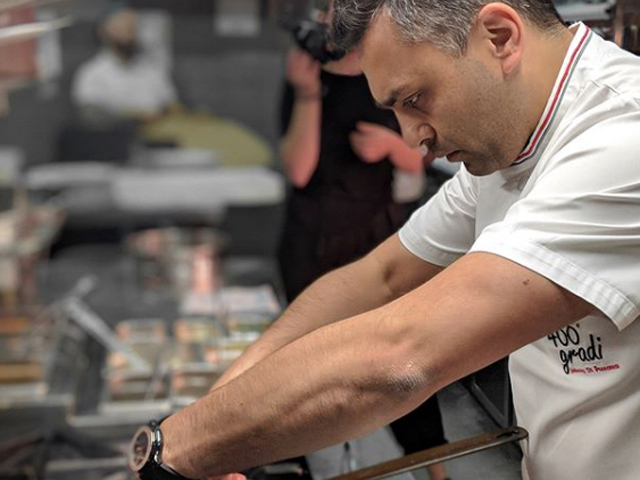 Adding to his list of outstanding achievements in 2018, Johnny Di Francesco, owner and founder of 400 Gradi has now been named Chef of the Month by Ocean Made Seafood. Renowned for his world-winning skills and most recently Oceania's Best Pizza, Johnny opted for his Frutti Di Mare Pizza to impress the team over at Ocean Made Seafood, and it clearly didn't disappoint! Combining his pizzaiolo skills with his love of shellfish, Johnny created one of his all-time favourite feasts. 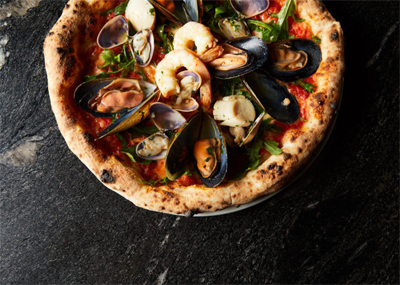 Fresh seafood full of flavour, cooked by Johnny, and added added on top of his award-winning pizza, takes the Frutti Di Mare Pizza to a whole new level. Johnny's endless knowledge of authentic Italian flavours and his love of seafood allows him to create new dishes with unmatched delicious-ness. Ahead of the family-orientated and food frenzy that is the Christmas season, Johnny has a wide range of tips and tricks for how to make simple and stunning Italian-inspired dishes for your summer Christmas celebrations - including how to cook prawns with truffle and cauliflower, or scallops with nduja and celeriac. Question: Congratulations on being named Chef of the Month by Ocean Made Seafood, what does this title mean to you? Johnny Di Francecsco: Thank you, it's always humbling to be recognised for my work and my passion! I'm really pleased to have been named Chef of the Month by Ocean Made Seafood - as working with seafood isn't easy, I'm really proud that I was able to hero the flavours whilst retaining a traditional Italian spin on the dishes. Question: What is your favourite seafood to cook and eat? Johnny Di Francecsco: I really enjoy working with shellfish. I love cooking all types of fish, but shellfish is just that little bit more special. The flavours are incredible and you really can use shellfish in such a variety of dishes. Two favourites to make – and eat – are prawns with truffle and cauliflower, and scallops with nduja and celeriac. Question: What's the trick to making the best pizzas, at home? Johnny Di Francecsco: Patience and passion are key. I always encourage people to make their own dough, but it needs to rest overnight so you need to make sure you allocate enough time for this. When it comes to topping your pizza, I always recommend using fresh, minimal ingredients that speak for themselves. It's the reason that a traditional Margherita is my all-time favourite! Question: How can we include seafood into our meals to impress family and friends? Johnny Di Francecsco: I love working with seafood, but I know it intimidates a lot of people, so opting for pre-cooked seafood is always a good idea! It also saves on a LOT of time, especially during hectic times like the festive season. Buying pre-cooked prawns and a bunch of oysters and putting a platter together can be one of the most impressive - and well received - dishes at any event, and you really didn't have to do anything! Question: What will you be serving your family and friends, this Christmas? Johnny Di Francecsco: 00 flour, san marzano tomatoes, basil, and fior di latte, and of course seafood! You'll find at least three of these ingredients in most Italian dishes, and with good reason. These ingredients are so versatile and can be used for a huge variety of meals, and each, when used properly, add the perfect touch of rich and authentic Italian flavour. Question: What always goes well with seafood? Johnny Di Francecsco: A glass of white wine and a good appetite always goes well! Question: Can you share your Frutti Di Mare Pizza recipe with us? Drain liquid and set seafood aside for a moment. Spread the tomato on the pizza base. Scatter fior di latte and drizzle extra virgin olive oil. Cook the pizza until crisp around the edges and the cheese has softened - about 10 mins. Take out of the oven and plate the rocket over the top. Place cooked seafood over the rocket and serve.